Yup, no sooner did I finish of my first portable N64 commission and ship it off did another come down the pipeline! Never have I had two such similar projects happen so close in time frame and it’s yielding some very cool improvements. Essentially this is a duplicate of the N64p I finished off last month, but taking everything I learned from the first version and perfecting it the second time around. There are a few key differences in this one though that required a bit of extra design work, but it will be well worth the effort in the final project. There are two big differences with this one. First, the screen is a completely different model than the other version. This is a wide screen 16:9 default ratio, however it does have an option to be 4:3 if the user wishes. I decided to go with for a few reasons, but the main reasons were picture quality and size. In my opinion, this screen is sharper than what I used last time as far as composite input goes and the thin profile and smaller driver board make this much easier to work with. The second difference is that my buyer in this case is based in the UK. This presented a problem at first because the UK and Europe use a different region code than the US. US uses NTSC for it’s format which is basically just a different hertz rating based on the electrical systems we use. NTSC is 60Hz and PAL is only 50Hz. So, this meant I had to use PAL hardware for the N64 as well as needing a few PAL games to test the system on. I also had to get a 220 to 110 transformer so he could use the battery charger that is specific to the batteries that are going in the thing. So although this one was very much the same, it had it’s share of “firsts” that I had to overcome. Fortunately they weren’t that difficult to get over. – Better ventilation for the regulator and system as a whole with a new vent panel cut into the top and a vent in the back. – Relocated headphone switch which has been moved to the face of unit instead of on the bottom where it could be accidentally pressed. – Custom home cut PCBs for the buttons, d-pad, headphone switch and power jacks. – PLA material for the 3D printed body and face of the casing instead ABS to prevent warping. – Custom brackets for all loose components like the audio amp and regulator for more secure mounting and less wire stress. So I’m pretty excited to see how this one is going to turn out and so far progress has been very quick and efficient. Time is still an issue as I don’t have much of it to dedicate, but at least when I do put the time in, it goes further. I should have most of the case parts finished off this week and then I’ll be able to start the fun part of sanding and painting and after that gets done I’ll start posting some progress pics! I’m excited to see how this one comes out! I’m really excited and inspired by you. I think i’ll dive a little deeper into case modding now. Hello! 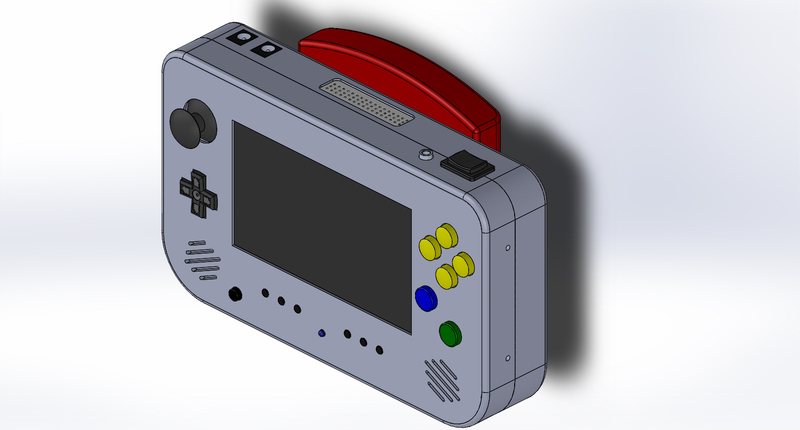 I am a 13 year old maker who is looking for an idea case for my first N64 Portable. I sketched out a design and then found yours, which looks very similar to mine. Would it be possible to get the 3D model from yours? I am not planning on selling anything.